I was going to start this post with a declaration of love for face oils but then I remembered my friend who uses coconut oil for 90% of her skincare, body, hair, and teeth cleansing routine and thought ehh maybe my feelings are more along the lines of strong like. Before we go any further, I feel like I should mention what I DON’T use oils to properly set expectations. Oils are not serums. Depending on source, they frequently contain bioactive compounds, but probably not in significant or consistent quantities. If you bought a bottle of rosehip oil thinking it’s an all-natural alternative to a properly formulated retinol product, you’re going to be sorely disappointed. Oils are not sunscreens. There are certain oils that will mitigate sun damage, but that is likely due to their antioxidant content, not because they’re filtering UV rays (so use an oil if you want but don’t neglect sunscreen). There are oil based products that contain active ingredients (Sunday Riley Luna, Holy Snails El Dorado, Samuel Jordan EtOILe, Goop Oil Sunscreen, the 2Sol oil discussed below) that obviously break this rule but in these cases, oil is the delivery system, not the agent, for those effects. Lastly, despite what the internet tells you, oils probably won’t cure your warts or tumors nor will they get rid of your stretch marks. If you suffer from any serious skin ailments, please consult a dermatologist and if you read any questionable claims online, look for citations to credible resources (i.e. Pubmed and Wisderm, NOT the EWG). Everywhere! It mixes well with moisturizers, it mixes well with toners, it works well applied directly to my skin, which I’ve been doing more and more especially when I think about all the beneficial compounds and antioxidants rice bran oil contains. I also will apply this before a sheet mask when my skin needs a boost in moisture. I purchased these through Ana with a bunch of other Kuramoto Bijin items. This item is available on Rakuten for ¥1,080 ($9.31 USD), or Amazon US for $15.82. This comes in an amber glass bottle and the oil is dispensed through a small hole. There’s a deep blue label that goes around the bottle. My one gripe about this oil is that the bottle seems to leak. I can’t identify where or why the leak is happening but it does leave things around it oily if I’m not careful about storing it upright. There’s not really a distinct fragrance. It smells like oil. This oil is a light yellow color and is of medium-ish weight. Cosdna does not recognize rice bran oil as either an acne trigger or irritant. This is my favorite oil of the bunch. My skin has a history of responding well to rice-based products and rice bran is no exception. Bran is the brown, outer, nutritious layer of rice. It is high in phytochemicals and formulations containing semi-purified rice bran extract has been shown to enhance hydration, lighten skin, improve skin thickness and elasticity. In addition, various phenyl compounds found in the roots of rice, trans-p-coumaric acid methyl ester and N-(trans-cinnamoyl)tryptamine, have been shown to have melanin inhibiting abilities and soaking skin in rice starch has been demonstrated to improve the healing capacity of damaged skin. Rice bran oil contains several bioactive compounds including ferulic acid, y-oryzanol, and phytic acid, which have potent antioxidant properties. In addition to being emollient and doing typical oil things, this rice bran oil also seems to calm my skin. I have reactive/easily inflamed skin and when I use this at night, my skin looks noticeably calmer in the morning. No other oil I’ve used so far has had this effect. I use this mainly in two ways. I either add a few drops to a moisturizer to make it more emollient or I will mix with cleansing oil for when I want to do a prolonged first cleanse / face massage. This oil is thick but has good slip, making it great for massages IMO and mixing with oil cleanser makes it easy to rinse off when I’m done. I purchased this from Stratia during its launch when it was 20% off. Each bottle contains 30ML and normally retails for $18. This comes in a tinted plastic dropper bottle. The top twists on really tightly, which prevents leaks, but sometimes is a little tricky to open when my hands are wet or lotiony. This oil smells really funky. It’s a little nutty, a little fishy, and a little like mayonnaise. It’s not pleasant. This is a golden olive color and has medium thickness. It’s a little thinner but similar to the feel of rosehip oil. Cosdna identifies squalane (1), jojoba oil (2), and tocopherol (2) as acne triggers and jojoba oil (0-2) and tocopherol (2) as potential irritants. One of the things I love about Stratia is their products are formulated to achieve specific goals: The borage seed, perilla seed, and cranberry seed oils are included for their essential fatty acid (omega-3, omega-6) content. Camellia japonica and marula oil contain oleic acid (omega-9).Together these oils can increase overall skin health, potentially reduce signs of aging, and have other effects such as mitigating UV damage and have anti-inflammatory and antioxidant powers. I tend to like thicker oils over thinner ones (because dry skin), and this oil has pretty much the ideal thickness in a face oil IMO. Last winter rosehip oil was my go-to product when my skin was irritated and functionally, I think this is very similar to rosehip but a wee bit more nourishing. The only issue is scent – I like using this but would enjoy it a lot more if the scent was less noticeable. After cleansing but before sunscreen or makeup. I purchased this from Lord & Taylor (which doesn’t seem to carry it anymore) during some sale. It’s also available on Nordstrom or Herbivore for $26. The rollerball contains 10ml (0.17oz) of product. This oil is in a rectangular, glass container and dispensed via rollerball. If nothing else, this oil has taught me that I HATE rollerballs. It’s ineffective (it takes FOREVER to get any product out) and seems extremely unsanitary. This has a slightly sour, herbal scent. Amaranth has a sour taste but I’m not sure that would carry over if only the squalane is extracted from the amaranth, so my guess is the scent is from the blue tansy, jasmine absolute, and rose absolute although. Strangely, this doesn’t smell like jasmine or rose at all to me. The scent is not strong enough to bother me but it’s just kind of weird and not at all expected. Blue in color, thanks to the inclusion of blue tansy oil. As an oil, this is fairly lightweight. I had high hopes for this oil. It’s blue which reminds me of Sunday Riley’s Luna oil, which I’m fond of, and it’s main ingredients are squalane and jojoba oil, which I also like. 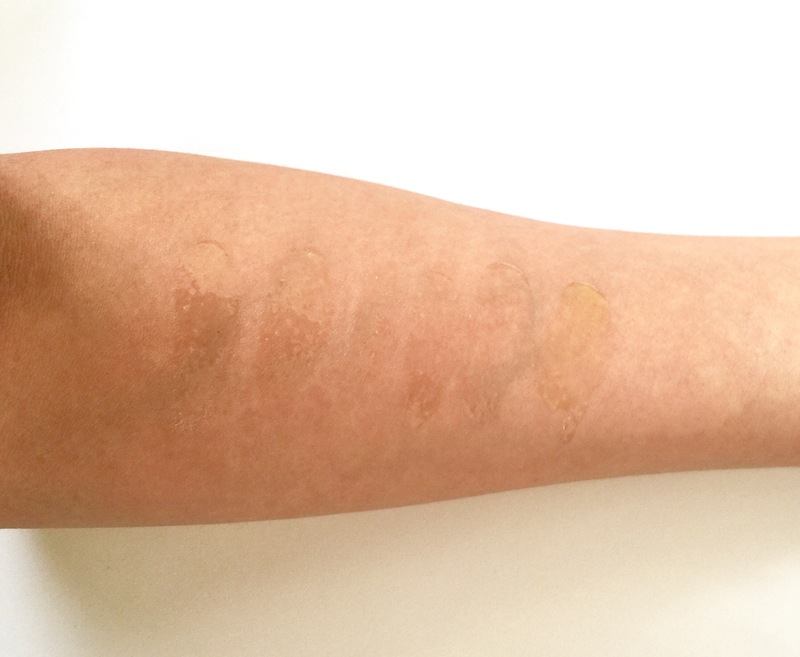 Squalane is one of the most common lipids produced by human skin cells. It accounts for 13% of the composition of sebum and is an excellent moisturizer. This squalane in this oil is extracted from amaranth, which is good because it means it’s not extracted from shark liver. I’m not vegetarian and usually don’t mind animal ingredients, but I do mind when they come from animals in decline. Jojoba oil is an emollient oil that also has anti-inflammatory properties and is known for being similar to human sebum. Unfortunately, on my skin Lapis didn’t stand out in any way nor did it produce any effects beyond basic emollience. I also cannot emphasize enough how much I HATE the rollerball packaging. Lastly, it’s worth mentioning this oil is advertised as having sebum-controlling properties. I think what they mean is this oil would be appropriate for oily skin, which I would agree given how light it is, BUT it’s not going to control sebum. Your pores don’t have a feedback mechanism which it would need in order for that to be possible. I add this to emulsions and creams but also works well sandwiched between earlier steps. I purchased this from Whole Foods for around $16. It is also available on Amazon for $11 or Marula’s website for $15.99. This comes in a clear, plastic pump bottle. The pump is designed such that you can twist to lock or open. However, the twisting mechanism is extremely unreliable so if you’re planning to travel with this, I’d recommend taping it down. Thin and lightweight. Light yellow in color. Cosdna doesn’t seem to know what marula oil is, so no clue as to its purported comedogenesis or irritation. Marula oil is super trendy right now and for good reason. It contains a host of beneficial fatty acids including oleic acid, linoleic acid, palmitic acid, and linolenic acid, antioxidants such as tocopherol, and sterols. Unfortunately, for me, this oil was pretty much indistinguishable from argan oil, neither of which did anything special for my skin. Experientially, it’s lightweight and thin, which might be appealing for some, but I actually prefer something thicker. Applied to skin like a serum or mixed with moisturizer. I purchased this as part of a group buy so I don’t remember exactly how much it cost. Maybe around $50? It’s also available on Glow Recipe for $70 (but on sale for $59 right now). Get 15% off your first Glow Recipe order here. White, round-bottomed, glass bottle. Product is dispensed through dropper cap. Smells like jasmine. I love jasmine. I love how this smells. Clear in color. This is a thin and very fluid oil. Cosdna recognizes olive oil (2), tocopherol (2), coconut oil (4), and soybean oil (3) as acne triggers and tocopherol (2) and coconut oil (1) as potential irritants. When I add this to moisturizers, there is very little difference in how the moisturizer feels or behaves with this oil vs without. Functionally, I really don’t think this essence oil does anything at all. It does smell amazing though but is that worth $50 – $70? Probably not. I mostly use this around my eyes. My under eye area is super prone to milia and so I have a lot of trouble with eye creams, so instead I take a drop of oil and gently dot it around my eyes. It also works well added to moisturizers. I purchased this from GMarket through a forwarding service (probably Koreanbuddy although TBH I can’t remember or find email confirmation). White, plastic airless pump bottle. I love airless pumps. Medium weight oil. Cloudy in appearance. Cosdna identifies no acne triggers and no potential irritants. Regular readers of this blog will know I’m a fan of horse oil and so when I saw that this is a retinol (rare for Korean products) AND horse oil product, I literally built a haul just to get this. It’s a very gentle retinol product – I experience no irritation, tenderness, or skin flaking of any sort from it. When I apply this around my eyes it definitely helps minimize the appearance of the few fine lines I have, but other oils like rice bran, camellia, or rosehip do that too. Long term, I haven’t noticed any permanent anti-wrinkling effects but retinol takes time to work. Komeyu – My favorite of the bunch. Medium weight, versatile, seems to calm redness in addition to providing emollients. Fortify – The thickest of the oils (followed by 2Sol Rejuventation Oil and Kuramoto Bijin Komeyu. The Acure Marula Oil, Herbivore Lapis Oil, and Blossom Jeju Soombi Essence Oil are all very thin). Very nourishing, but smells funky. Lapis – Hate the packaging. Oil is meh. Marula – Lightweight oil. Kind of meh but very usable. 2Sol – Super emollient, works great under eyes, and has interesting ingredients. Effects of retinol have yet to be seen. Hope this was helpful. I would also love to hear about any oils you guys have loved or hated! Disclaimer: All products shown here were purchased by me. The opinions expressed are my own. This post contains an affiliate links. Purchasing an item through an affiliate link does not add any cost to the customer but does help support this site’s upkeep. Ahh, it’s like you knew I started my day thinking about getting a new face oil since my Palmer’s one is a bit heavy. The 2Sol and Rice Bran oil are both coming home with me today, I think 🙂 Also I’m glad someone else is not buying into the Herbivore hype with that Lapis oil — the fact no one was fired for putting “rollerball delivery” on the white board still boggles my mind. Thank you for such a helpful post! I’m going to look for the Komeyu oil here, I’ve had good luck using oils around my eyes in particular. The redness calming you saw seems especially intriguing. Thanks for the very in depth review. Great review, I’m still waiting for my Komeyu rice bran oil (ordered via eBay) and was thinking of buying Acure Marula oil to add to my routine. I’m 46 with sensitive but oily/combo skin and gets clogged pores pretty easily so I was nervous about it. Been doing the Asuan skincare for 4 months now and it’s helped my skin. I do have a question in terms of putting oil during serum or essence stages: will the oil get in the way of other serums and cream fr being absorbed? I’ll try putting oil before masks (I usually do all my essence and serums before putting mask) as that will probably enhance the absorptions of oil and mask essence. I would give the oils a few minutes (10-15) to sink in before applying serums or creams on top. I haven’t had issues with things absorbing over oils for the most part, but I have rather dry skin that can soak up a lot of oil lol. If you want to try it out, maybe start by using a drop or two and see how your skin responds? Have you tried the oils from Huxley or Olivarrier, what do you think of them? I haven’t! The fragrance in the Huxley oil gives me pause since it seems people seem to either love it or hate it. hi it seemed you like the komeyu a lot. Have you tried other generic rice oil (cold pressed) or is it this specific brand that give you good result? I understand they are some kind of brewery?